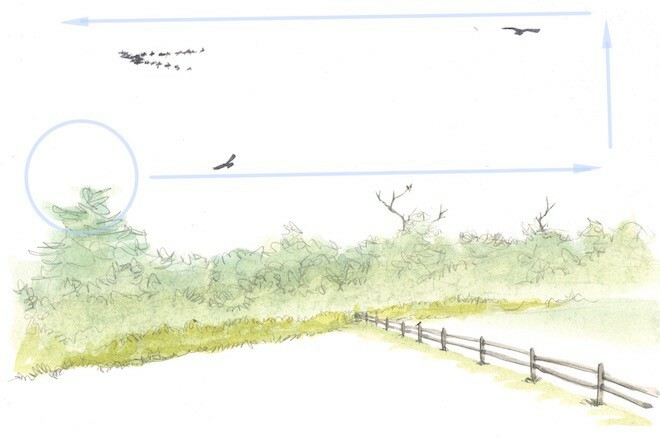 Blue arrows (above) show how to move your binoculars to find distant birds. Start with a distant treetop (circle) and scan the sky just above the tree line. Then raise your binoculars and look higher while scanning in the other direction. Also, pay special attention to bare snags, field edges, fence posts, and other likely perches. Art by David Allen Sibley. The essential first step in birding is simply finding birds to watch. 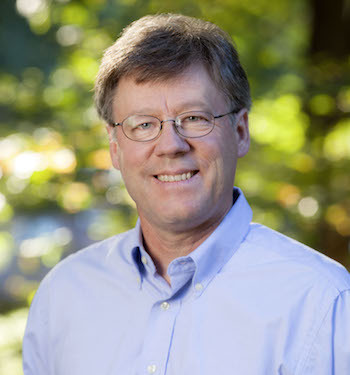 Moving to the next step — identification — is possible only after a bird has been located. Experienced birders use both conscious and subconscious habits to maximize their chances of finding birds. Making frequent use of binoculars is one of the habits. 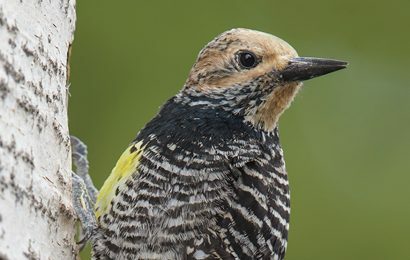 The primary purpose of binoculars is to magnify distant birds, allowing you to see more details, but binoculars can also be helpful for locating birds. Don’t hesitate to use your binoculars even when no birds are visible. Whenever you find yourself in an open area, try pausing occasionally and lifting your binoculars to scan. 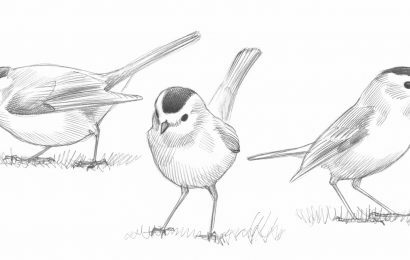 Pay special attention to edges — mudflats, hedgerows, fences, tree lines — and check any prominent perches for birds. 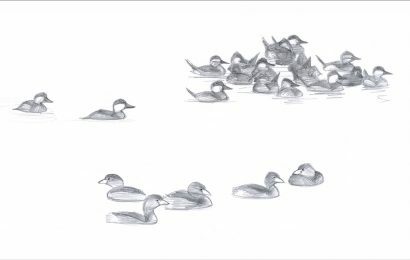 As you gain experience, you will develop a sense of where the birds are likely to be, and where to devote the most effort in your scanning. Scanning the sky can be particularly helpful. Start with a distant treetop (use it to make sure your focus is set for the right distance) and scan left or right along the horizon. 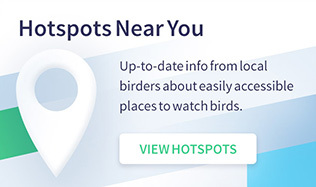 This is where you are most likely to find distant birds. 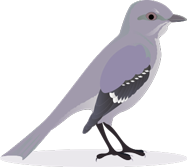 Birds generally don’t fly very high, so a low-angle scan is more likely to intersect with a bird. At the end of a horizon scan, raise your binoculars slightly and reverse direction, scanning the band of sky just above your previous scan, and repeat this several times. It’s generally not profitable to scan directly overhead with binoculars, as most birds there are within range of the naked eye and they tend to be dispersed across a wide area, requiring a lot of scanning to find. Nevertheless, an occasional random check of the sky overhead is definitely worthwhile. If clouds are present, it’s best to scan those. Birds will be more obvious against a cloudy background, and the cloud will provide something for your eyes to focus on. Whenever you do find a bird, take a few extra seconds to scan around it, looking forward and back along its flight path to see if it has company. If you are at a hawk watch, you’ll see people taking all of these steps — and no one scans more than the experienced hawkwatchers — but even when you aren’t watching hawks, it’s worth a try. Just lift your binoculars and start scanning the sky. There’s no telling what you’ll find. 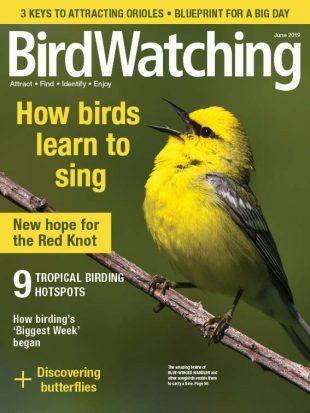 This article from David Sibley’s “ID Toolkit” column appeared in the July/August 2016 issue of BirdWatching.